On the eve of the US GP, guest contributor Ismail Vedat looks at the Nico Rosberg-Lewis Hamilton title saga of 2016. While Lewis Hamilton has been grabbing the headlines for all the wrong reasons in recent weeks, there is one driver on the other side of the Mercedes garage who is welcoming the attention being on his teammate. 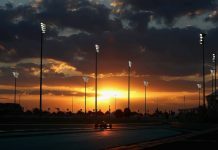 Nico Rosberg has been quietly going about his business at the top of the drivers’ standings and has a 33-point lead over Hamilton in the battle for this year’s World Championship. With four races to go, the F1 circus arrives at Austin this weekend for the United States Grand Prix. Traditionally, the US is a place where Hamilton has been untouchable. When the race was hosted at Indianapolis, it was back in 2007 where Hamilton secured his maiden pole position and first victory in F1 in the year he almost took the title as a rookie. Since 2012 Austin has played host to the US Grand Prix, and Hamilton has reigned supreme, winning three of the four races and securing his third world title at this circuit last year. If there was one track that Hamilton could pick to start clawing his way back into the title fight and into Rosberg’s lead, it would be Austin. 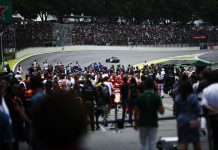 Since the summer break Hamilton has yet to win a race, finishing third three times and second in Monza whilst also suffering an engine failure in Malaysia – where he was leading with 15 laps to go. With Hamilton suffering reliability problems, Rosberg has stepped in and taken full advantage of his teammate’s misfortunes. The German has won four of the last five races and is closing in on a first title triumph. But, as we all know with this sport that we love, things are never as simple as they appear to be. Rosberg will be fully aware that Hamilton is a danger as a wounded animal with the latter having nothing to lose. Hamilton has already said if he relinquishes his world crown to his teammate he will be gracious in defeat, but followers of Hamilton will know that the Briton wears his heart on his sleeve and is fully committed in everything he does, so there is plenty of fight left in the current world champion. Hamilton’s Snapchatting during the press conference of the Japanese Grand Prix sparked controversy within the media, with some journalists being blocked on social media by Hamilton. The numbers are very simple for Hamilton. 100 points on offer as the season draws to a close. While Hamilton may get an unlimited amount of numbers for his Snapchat posts, the margins are a lot finer on the track as the battle between the two Mercedes drivers prepares to reach boiling point over the coming few weeks. Next articleSilly Season for 2017: Who goes where?